Organizing process is the process of creating the organizational structure of an enterprise. The organizing process consists of several stages. First, you need to divide the organization into departments, respectively to strategies, and then establish relationships of authority. After that, managing director delegates his rights and authorities. Delegacy is the transfer of the tasks and powers of the person who assumes responsibility for their implementation. If the leader does not delegate tasks, then he should do them. Responsibility is a commitment to carry out existing tasks and be accountable for their satisfactory result, which can’t be delegated. The authority is a limited right to use the organization's resources and to direct the efforts of its staff to perform certain tasks, which is delegated to a position, not to the person who holds the position. There are two types of authority: line and staff. Line authority creates a hierarchy of levels of control, where instructions are transferred directly from a manager to a subordinate and then to the other employee. Staff authority is an advisory, personal apparatus e.g. presidential administration, which has no hierarchy. Organization structure is an important part of organizing process and there are many tools to facilitate that. Competent organogram structuring can significantly improve the efficiency of the organization or department. 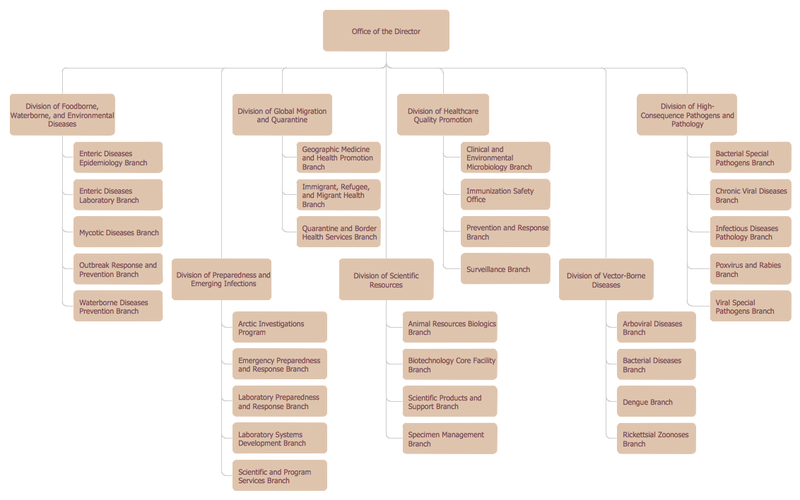 Organization chart is a diagram displaying organization posts written in boxes and arrows, connecting them and showing the subordination of positions and relations between company departments and workers. Organizational chart should be a proactive management tool, not a reactionary. It shouldn’t reflect the current hierarchy and chain of command in the company, but the one which is more consistent with the goals of the company. Therefore, this scheme should be developed by senior management, in cooperation with the HR department, discussed with the heads of key departments. Such a diagram should be the goal to which the organization wants to strive to improve the effectiveness of their work. If the organization is too large, the chart can be divided into smaller ones. 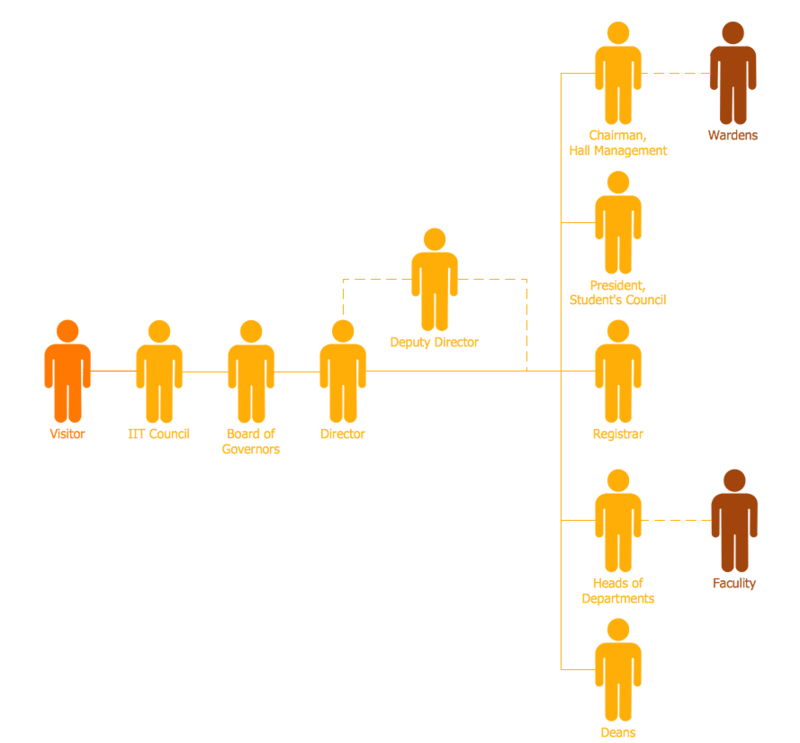 Organogram must clearly show the company's hierarchy and subordination structure. One of the largest threats to the company's performance is the double subordination of employees. It is important to comply with horizontal layers of the chart. Employees of the same status shall be placed on the same horizontal line, even if some of them directly subordinate to the supreme manager, and some to the interim manager. This allows employees to forge interagency communication on their horizontal level more effectively, helping to communicate with people endowed with the same amount of responsibility. The lack of qualitative interaction between departments reduces the efficiency of the company. ConceptDraw STORE allows you to navigate the ConceptDraw Solution Park, manage downloads and updates, take the access to libraries, templates and samples. 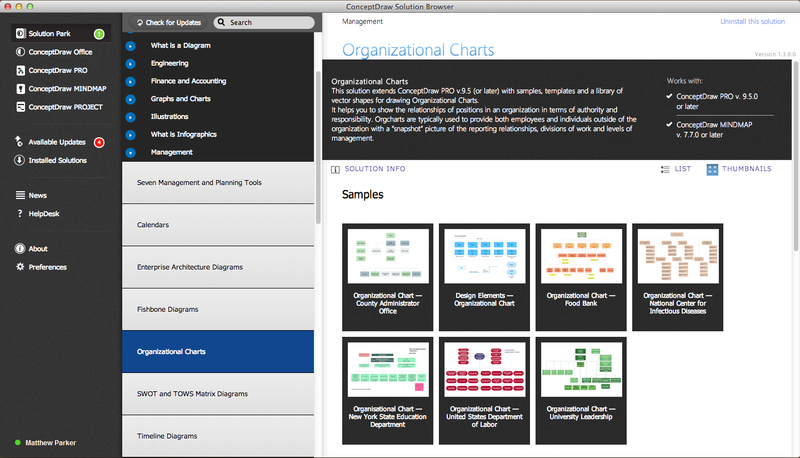 Organizational Charts Solution is available from the ConceptDraw STORE too. to help you quick and easy design your own Organograms. Use actively the colors designing your Organograms. 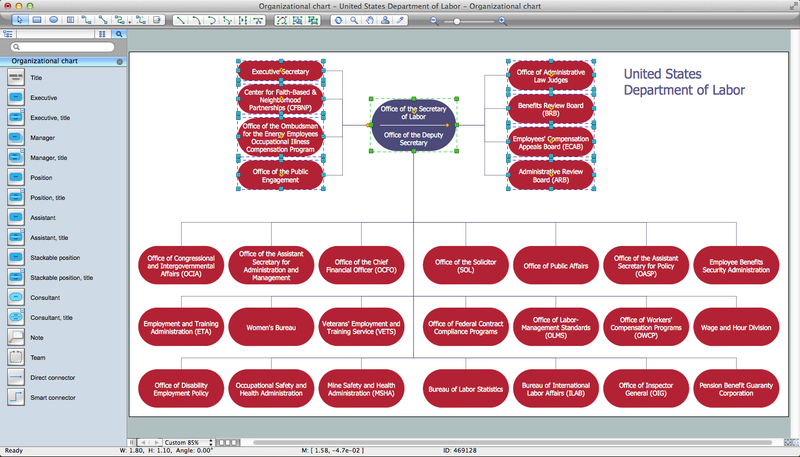 ConceptDraw DIAGRAM Organogram Software offers you a huge color palette. Colored, bright Organograms have greater success. 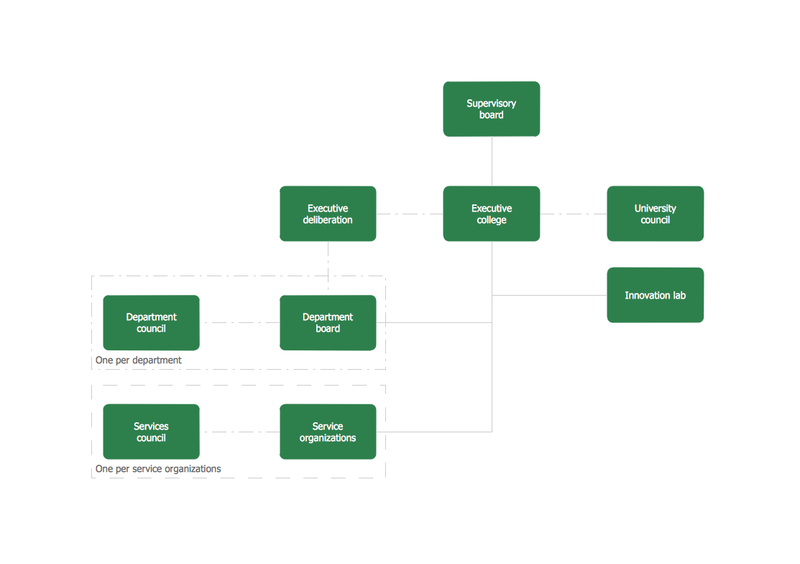 This example was created in ConceptDraw DIAGRAM using the tools of Organizational Charts Solution and demonstrates an organogram of the management organization of the Eindhoven University of Technology. An experienced user spent 5 minutes creating this sample. Use the Organizational Charts Solution for ConceptDraw DIAGRAM to create your own Organograms of any complexity quick, easy and effective. The Organograms designed with ConceptDraw DIAGRAM are vector graphic documents and are available for reviewing, modifying, converting to a variety of formats (image, HTML, PDF file, MS PowerPoint Presentation, Adobe Flash or MS Visio), printing and send via e-mail in one moment.